Over recent years, a greater diversity of spaces has opened up worldwide for the making and display of art beyond the gallery. A new 'space consciousness' has developed, with an emphasis on the significance of the spatial. Judith Rugg takes up a range of site-specific artworks internationally located in countries ranging from China to France, Italy and the UK, Argentina and Canada to Australia, Poland and the Netherlands to explore the relationships between site-specific art and space set within its globalising contexts. Through close inspection of works such artists as Doris Salcedo, Langlands and Bell, Phyllida Barlow and Vong Phaophanit, Rugg considers how an interdisciplinary spatial theory can inform many elements of contemporary art. In clear, illustrated chapters, she engages with very contemporary spatial issues, including those of the environment, cultural identity and belonging, as well as experiences of displacement, migration and marginalisation and the effects of urbanization and tourism. For students and practitioners of fine arts, art theory and history, as well as those who are fascinated by site-specific art, this is an original and challenging exploration. 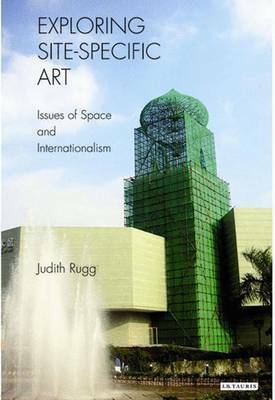 Judith Rugg is an artist and art theorist and Reader in Critical and Cultural Theory at the University for the Creative Arts. She is co-editor of 'Advances in Art and Urban Futures' (2002) and of 'Issues in Curating: Contemporary Art and Performance' (2007).